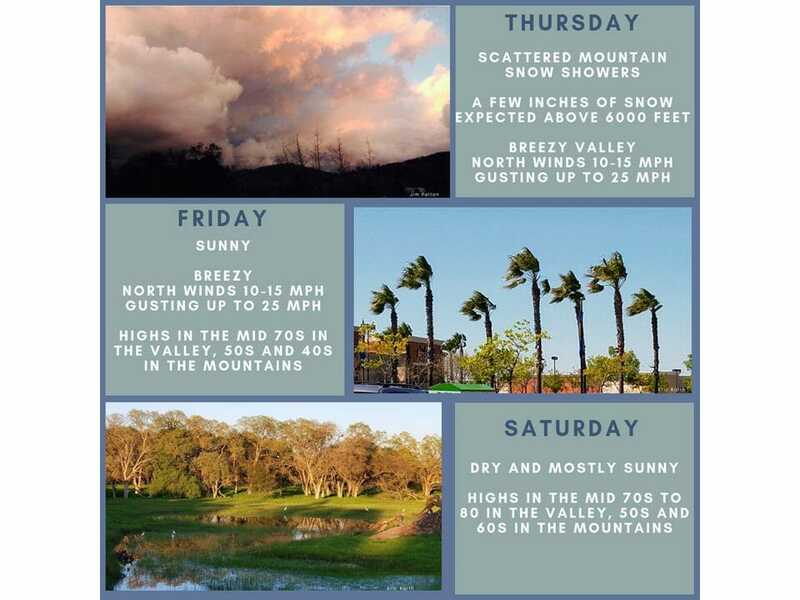 April 11, 2019 – Weak systems will bring some showers to the mountains today and again early next week. A weak system will drop southward across the region today bringing some showers over the foothills and mountains. Precipitation amounts will be relatively light, ranging from a few hundredths of an inch to around a quarter of an inch of liquid equivalent over the mountains. Some of this will be in the form of snow, with a few inches of accumulation possible from around 6000 feet and above. Since most of the showers will be in the afternoon, the accumulation on roads will be limited, so minimal impacts on travel are expected. For the Valley, dry weather is expected with mostly cloudy conditions and a little below normal temperatures. Breezy northerly winds are expected, and these will continue through Friday. Friday highs will be warm, with mostly sunny skies as eastern Pacific ridging builds eastward over the region. Saturday looks even warmer, with Valley and Delta highs in the mid 70s to upper 70s, near 80 over the northern San Joaquin Valley. The next system drops southward into the northern mountains Saturday night, extending into the northern Sacramento Valley and northern Sierra on Sunday. Light snow accumulations are possible above 6500 feet. Rainfall amounts are expected to be highest over the mountains of western Plumas County/Lassen Park, where around a third of an inch is currently forecast. Winds shift to south – southwest. Cooler, near normal high temperatures are expected Sunday. Extended forecast starts out with a shortwave upper trough forecast to clip the northeast corner of the state Monday afternoon. This will bring a threat of showers mainly to the mountains and northern Sacramento valley. This will be a fairly dry system and precipitation amounts are expected to be light so impacts will be minimal. The light shower threat continues into Tuesday as the upper trough moves into the Great Basin. Upper ridge builds quickly over the west coast Tuesday night and Wednesday bringing clearing skies. Fair skies and warming airmass will bring up high temperatures Wednesday to around 10 degrees above normal for this time of year. Most areas will see breezy north winds but northerly gradients are not expected to be especially strong so again the impacts are expected to be minimal. Upper ridge axis forecast to move inland over the west coast by next Thursday bringing a little more warming with valley daytime high temperatures forecast to push into the 80s.